Grudziądz [ˈɡrud͡ʑɔnt͡s] ( listen) (German: Graudenz, Latin: Graudentum or Graudentium or Grudentia) is a city of around 96,042 inhabitants (2010) on the Vistula River in northern Poland. Situated in the Kuyavian-Pomeranian Voivodeship (since 1999), the city was in the Toruń Voivodeship from 1975 to 1998. 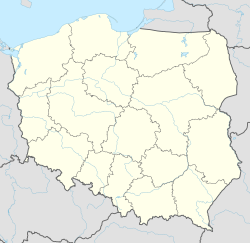 Grudziądz is located close to the east shore of river Vistula, approximately 22 kilometres (14 miles) north-east of Świecie, 93 km (58 mi) south of Gdańsk and 170 km (106 mi) south-west of Kaliningrad. Initially Grudziądz was a defensive gród founded by Polish ruler Bolesław I the Brave. The settlement was re-fortified again from 1234 by the Teutonic Order; the erection of the castle with the help of stone as building material was begun with around the middle of the 13th century. Under the protection of the castle the settlement gradually begun to develop to a town. In 1277 both "the castle and the town" were besieged heavily by the Yotvingians. The settlement adopted Kulm law in 1291 while under the rule of the monastic state of the Teutonic Knights. The oldest building parts of the Catholic St. Nicholas' Church stem from the end of the 13th century. The Holy Spirit Church, which apparently was founded already during the 13th century, is mentioned together with the town's hospital for the first time in 1345. Also other documents reveal that in the 14th century the town had already a well-developed infrastructure. A document of 1380, as an example, refers to the construction of an aqueduct, of a fountain and of the establishment of a town-hall cellar. During the era of the State of the Teutonic Knights Graudenz had become a distinguished trade center, in particular for textiles and agricultural products including grain. Around 1454 Graudenz had already reached about the same level of economical development as other towns in western Prussia, such as Danzig (Gdańsk), Elbing (Elbląg), Thorn (Toruń), Marienburg (Malbork), Kulm (Chełmno), Konitz (Chojnice), Neumark (Nowe Miasto Lubawskie) and Preußisch Stargard (Starogard Gdański). In 1440, Graudenz joined the Prussian Confederation opposing the government of the State of the Teutonic Knights. At the beginning of the Thirteen Years' War of the Cities (1454–66) the citizens forced the Teutonic Order to hand over the castle. Although in the town there existed also a strong party supporting the Knights, during the entire war both the town and the castle remained in possession of the confederation party. The confederation party formally asked the King of Poland, Casimir IV Jagiellon, to join Poland. Thus, among other towns, in the mid-15th century Grudziądz also came under the protectorate of Poland. Between 1466 and 1772 the city belonged to the province of Royal Prussia under the crown of the Kingdom of Poland. After the great depression of the War of the Cities, new economical growth in the town was slow before the middle of the 16th century; the progress was hampered by the religious struggle, and by the Polish–Swedish wars throughout the 17th century. At the end of 1655 the town and its castle were captured by the Swedes, who held them occupied for four years. In 1659 the Swedes had been besieged for several days and retreated. During their departure part of the town was destroyed by fire. Following Protestant Reformation, in 1569 the local Protestants were given access to the Holy Spirit Church; in 1572 Catholicism seemed to have vanished almost entirely in the town. In 1597 King Sigismund III Vasa gave order that the Protestants had to return all churches taken over by them in the past to the Catholics, including all accessories. The Protestants remained in possession solely of St. George's Church until in 1618 the base of the building was washed under by river Vistula, and the church had to be torn down. For a while they utilized once more the vacant Holy Spoirit Church, until in 1624 this building together with the hospital had to be handed over to nuns of the Order of Saint Benedict for the purpose of founding an affiliated institution. Since 1622 Jesuits from Thorn (Toruń) had a station in Graudenz, which in 1640 was already so strong that it was able to form a residence in Graudenz, despite of objections from the side of the magistrate of the town. In 1648 construction work for building a Jesuit church was taken up. The town proper was surrounded by town walls, except on the side of river Vistula, where instead of walls there stood huge massive grain silos, from where grain could be transported through wooden pipes to the embankment of the river. Following the First Partition of Poland in 1772, the city was annexed by the German Kingdom of Prussia. In 1773 the town had a population of only 2,172 persons. In order to stimulate municipal trade, Frederick the Great brought in 44 colonist families. Grain trade flourished; among the most successful grain traders was the Schönborn family. In 1776 a decision was made to build a fortess in the town. During the Napoleonic invasion in Prussia in 1806/07, the fortress was successfully defended by General of Infantry Wilhelm René de l'Homme de Courbière against attacks by French troops. In 1871 Graudenz became part of the unified German Empire. With the improvement of the railway network in Germany, Graudenz transiently lost its meaning as an important trading place for grain. In 1878 the railway line Goßlershausen—Graudenz was opened. After the construction of a railroad bridge across the Vistula in 1878, in 1879 the railway line Graudenz—Laskowitz was opened in addition, and Graudenz became a rapidly growing industrialized city. In 1883 also the railway line Thorn—Graudenz—Marienburg was taken into operation. In 1899 a Chamber of Commerce was opened in Graudenz, and in 1900 the town became a district center. A light cruiser of the German Imperial Navy, built in 1912-1914, was named after the city. The newspaper Der Gesellige, founded by book seller Rothe in 1826, belonged up to the end of World War I to the most widely spread newspapers of east Germany. Around the turn to the 20th century, Graudenz had become an important cultural centre in east Germany with numerous schools, municipal archives and a museum. The city was the site of a military prison for Polish activists - those released, who left Europe, formed the Gromada Grudziądz in Portsmouth, England, in 1835, as part of the Great Emigration movement. Until 1920 Graudenz belonged to the administrative district of Regierungsbezirk Marienwerder in the Province of West Prussia. In the 18th and 19th centuries the city was part of the area affected by the Prussian Partition of Poland, where Germanisation was enforced, beginning in 1772. Frederick had nourished a particular contempt for the Polish nation and state. He brought in German and Frisian workers and peasants there, who in his opinion were more suitable for building up his new civilization. Frederick settled around 300,000 colonists in the eastern provinces of Prussia. Using state funds for colonization, German craftsmen were placed in all local Polish cities. A second colonization wave of ethnic Germans was pursued by Prussia after 1832. Laws were passed aimed at Germanisation of the Polish inhabited areas and 154,000 colonists were settled by the Prussian Settlement Commission before World War I. Professor Martin Kitchen writes that in areas where the Polish population lived alongside Germans a virtual apartheid existed, with bans on the Polish language and religious discrimination, besides attempts to colonize the areas with Germans. In 1890 only about 200 Poles lived in the town of Graudenz, but approximately 16,850 Poles in the rural district of Landkreis Graudenz (as compared to about 26,000 Germans in Landkreis Graudenz). To resist Germanisation, Polish activists started to publish the newspaper "Gazeta Grudziądzka" in 1894. It advocated the social and economical emancipation of rural society and opposed Germanization – publishing articles critical of Germany. The German attempts to repress its editor Wiktor Kulerski only helped to increase its circulation. From 1898 to 1901, a secret society of Polish students seeking to restore Polish independence operated in the city, but the activists were tried by German courts in 1901, frustrating their efforts. In Graudenz, German soldiers were stationed in the local fortress as part of the Germanization measures, and the authorities placed soldiers with the most chauvinistic attitude towards the Poles there. The German government brought in more stationed military, merchants and state officials to influence population figures. In the 1910 census 84% of the population of the town and 58% of the county was recorded as German. Census figures published by the German Empire have been criticised as unreliable. Historians believe they have a high degree of falsification; formal pressure on census takers (predominantly school-teachers) was possible, and a new bilingual category was created to further complicate the results, as bilingual people(that is those who could speak both German and Polish) were classified as Germans. Some analysts have asserted that all people registering as bilingual were classified as Germans. The Polish population in this heavily Germanised city has been officially estimated at around 12-15% during this period. In 1913, the Polish Gazeta Grudziądzka reached a circulation of 128,000, making it the third largest Polish newspaper in the world. When on January 23, 1920, the regulations of the Treaty of Versailles became effective, and the Polish Corridor was arranged in a newly reborn Polish state (Second Polish Republic), Graudenz was incorporated under its Polish name Grudziądz into the new Second Polish Republic, although a majority of inhabitants of Grudziądz were German. At that time Józef Włodek, the newly appointed Polish mayor, described his impression of the town as "modern but unfortunately completely German"
Between 1926 and 1934 the number of Germans (34,194 in 1910) rose from 3,542 to 3,875. Some Polish authors emphasize a wider emigration pattern motivated chiefly by economic conditions and the unwillingness of the German minority to live in the Polish state. Prejudices, stereotypes and conflicts dating back to German harsh rule and discrimination of Poles influenced Polish policies towards minorities in the new independent Polish state. The Polish authorities, supported by the public (e.g. the “explicitly anti-German” Związek Obrony Kresów Zachodnich), initiated a number of measures to further Polonization. The local press was also hostile towards the Germans. In the 20 years between the world wars, Grudziądz served as an important centre of culture and education with one of the biggest Polish military garrisons and several military schools located both in and around the city. A large economic potential and the existence of important institutions like the Pomeranian Tax Office and the Pomeranian Chamber of Industry and Trade, helped Grudziądz become the economic capital of the Pomeranian Voivodeship in the interwar period. Grudziądz's economic potential was featured at the First Pomeranian Exhibition of Agriculture and Industry in 1925, officially opened by Stanisław Wojciechowski, President of the Second Polish Republic. The 64th and 65th Infantry Regiments and the 16th Light Artillery Regiment of the Polish Army were stationed in Grudziądz during the 19 years of the inter-war period. They were part of the 16th Infantry Division, which had its headquarters in the city, as did the cavalry's famous 18th Pomeranian Uhlan Regiment. The Grudziądz Centre of Cavalry Training educated many notable army commanders. Military education in Grudziądz was also provided by the Centre of the Gendarmerie, the Air School of Shooting and Bombarding, and the N.C.O. Professional School, which offered courses for infantry reserve officer cadets. In 1920 a German-language school was founded. In 1931 the Polish government decreed a reduction in the number of German classes in the school and requested lists of Catholic children and those pupils with Polish-sounding names which they viewed as victims of Germanization, from the German school. Although the list was not prepared, some of the children were transferred, which led to a school-strike. The German school followed ideas and customs as those in Nazi Reich. It was headed by a Nazi sympathiser Hilgendorf who praised Nazi ideology The Polish authorities were alarmed when a notebook of one female student was discovered by them, which contained the Nazi party anthem, the Horst Wessel Lied and revisionistic text. The discovery caused outrage and calls to dismiss Hilgendorf due to his irredentist beliefs In November 1933 two German craftsmen were killed by a Polish mob during a local election campaign. German population in Grudziądz welcomes invading Nazi forces. On 3 September 1939 units from the Wehrmacht entered the town after the Battle of Grudziądz and occupied it. From 26 October 1939 to 1945 Graudenz was part of the administrative district of Regierungsbezirk Marienwerder in the new province of Reichsgau Danzig-West Prussia. Graudenz was the location of the German concentration camp Graudenz, a subcamp of Stutthof concentration camp. On 6 September the whole city was covered with posters demanding that Jews and "mixed races" of category I and IInd degree (so-called Mischlinge, i.e. persons of mixed race) gather at the headquarters of the Einsatzgruppe V (established in the local school). Around 100 people responded to the demand and were immediately arrested and robbed. After this they were transported to an unknown destination and disappeared - it is believed that they were most likely executed by the Germans in the Mniszek-Grupa forests. On 19 October Graudenz was visited by the NSDAP Gauleiter (regional chief) Albert Forster. In a public speech to the Volksdeutsche, he declared that the area was to become "one hundred percent" German, and that Poles "have nothing to do here, and should be evicted"
Alongside the military and Einsatzgruppen administration, the first structures of Selbstschutz were established - a paramilitary formation of members of the German minority in the region. The head of Selbstschutz in Graudenz was Doctor Joachim Gramse. In October 1939, Selbstschutz created an internment camp for Poles seeking to restore Polish independence, whose commandant was a local German Kurt Gotze. Further executions were carried out in desolate areas of Graudenz: on 11 November 1939 near Graudenz Fortress, the Selbstschutz executed ten Polish teachers, four Polish priests and four women. Additionally, 37 people were murdered in Graudenz city park. On 29 October 1939 a unit of Selbstschutz mass-murdered ten Polish hostages as revenge for posters that had appeared in the city calling for resistance against Nazi rule. As the result of heavy fighting in 1945, over 60% of the city was destroyed. Soviet Major Lev Kopelev participated in those battles and covered the final surrender of the German garrison in his book "To Be Preserved Forever". He describes the joint psychological warfare in March 1945 by the Red Army and members of the NKFD. As the war ended, the German population of the city fled or was expelled to Germany. The city became home to Poles who had emigrated from Polish areas annexed by the Soviet Union east of the Curzon line, where they had been asked by the Soviet authorities to either accept incorporation into the U.S.S.R. or to leave what had been their former homeland. Grudziądz has two professional sports teams. The largest following has the popular speedway team GKM Grudziądz, whereas the local football team Olimpia Grudziądz has a slightly more modest following, playing in the second tier of Polish football. ^ "Orbus Latinus". Retrieved 2012-04-09. ; the form Grudentia is used by, e.g., A. Lentz, Philologus 23 (1866), p. 175. ^ a b "Grudziądz". Encyclopædia Britannica Online. Retrieved May 8, 2013. ^ Ritter, Gerhard (1974). Frederick the Great: A Historical Profile. Berkeley: University of California Press. p. 172. ISBN 0-520-02775-2. ^ Ritter, Gerhard (1974). Frederick the Great: A Historical Profile. Berkeley: University of California Press. p. 180. ISBN 0-520-02775-2. ^ Fryderyk II Stanisław Salmonowicz Zakład Narodowy im. Ossolińskich, 1985 "Z funduszy na kolonizację osiedlano w miastach fachowców z krajów niemieckich"
^ Michael Rademacher: Deutsche Verwaltungsgeschichte Provinz Westpreußen, Stadt- und Landkreis Graudenz (2006). ^ Gemeindelexikon für die Regierungsbezirke Allenstein, Danzig, Marienwerder, Posen, Bromberg und Oppeln (in German). Berlin: Königlich Preußisches Statistisches Landesamt. 1912. ^ National Identity and Weimar Germany: Upper Silesia and the Eastern Border, 1918-1922, T. Hunt Tooley, page 13; University of Nebraska Press. ^ Borodziej, Wlodzimierz; Endres, Gerald; Lachauer, Ulla (2009). Als der Osten noch Heimat war (in German). Rowohlt. p. 127. ISBN 978-3-87134-644-6. Quotation:"Es habe auf ihn,..., den Eindruck einer modernen und "leider völlig deutschen" Stadt gemacht,"
^ Kotowski, Albert S. (1998). Polens Politik gegenüber seiner deutschen Minderheit 1919-1939 (in German). Forschungsstelle Ostmitteleuropa, University of Dortmund. p. 55. ISBN 3-447-03997-3. ^ Polens Politik gegenüber seiner deutschen Minderheit, 1919-1939 (Studien der Forschungsstelle Ostmitteleuropa an der Universität Dortmund). S. 94. ^ Polens Politik gegenüber seiner deutschen Minderheit, 1919-1939 (Studien der Forschungsstelle Ostmitteleuropa an der Universität Dortmund). S. 94-95. ^ a b c Borodziej, Wlodzimierz; Endres, Gerald; Lachauer, Ulla (2009). Als der Osten noch Heimat war (in German). Rowohlt. ISBN 978-3-87134-644-6. ^ Eser, Ingo (2010). Volk, Staat, Gott, Die deutsche Minderheit in Polen und ihr Schulwesen 1918-1939 (in German). Nordost Institut, University of Hamburg. p. 415. ISBN 978-3-447-06233-6. ^ Barbara Bojarska: Eksterminacja inteligencji polskiej na Pomorzu Gdańskim (wrzesień – grudzień 1939). Poznań: Instytut Zachodni, 1972, pp. 78-79. ^ Maria Wardzyńska: Był rok 1939. Operacja niemieckiej policji bezpieczeństwa w Polsce. Intelligenzaktion. Warszawa: Instytut Pamięci Narodowej, 2009, ss. 109–110. ^ Jan Sziling. Niektóre problemy okupacji hitlerowskiej w Grudziądzu (1939-1945). „Rocznik Grudziądzki”. V-VI, ss. 448–449, 1962. ^ Jan Sziling. Niektóre problemy okupacji hitlerowskiej w Grudziądzu. S. 450. ^ Barbara Bojarska: Eksterminacja inteligencji polskiej na Pomorzu Gdańskim p. 124. ^ Zbigniew Otremba: Grudziądz. Kronika miasta. Gdańsk: wydawnictwo Regnum, 2007, ss. 81–82. ISBN 978-83-920686-1-7. ^ Henryk Bierut: Martyrologia grudziądzan podczas okupacji hitlerowskiej. Grudziądz: Wydawnictwo Komitetu Ochrony Pamięci Walk i Męczeństwa w Grudziądzu, 1999, s. 9. ^ a b Maria Wardzyńska: Był rok 1939... page 171. ^ Jan Sziling. Niektóre problemy okupacji hitlerowskiej w Grudziądzu...page 451. ^ Bogdan Chrzanowski: Eksterminacja ludności polskiej w pierwszych miesiącach okupacji (wrzesień − grudzień 1939) w: Stutthof: hitlerowski obóz koncentracyjny. Warszawa: Interpress, 1988, page 16. ^ Maria Wardzyńska: Był rok 1939, page 172. ^ Henryk Bierut: Martyrologia grudziądzan podczas okupacji hitlerowskiej, page 54. ^ Zbigniew Otremba: Grudziądz. Kronika miasta. Gdańsk: wydawnictwo Regnum, 2007, pages 81–82. ^ Maria Wardzyńska: Był rok 1939.... page 172. ^ Henryk Bierut: Martyrologia grudziądzan podczas okupacji hitlerowskiej, page 10-11. "Graudenz" . Encyclopædia Britannica (11th ed.). 1911. This page was last edited on 8 April 2019, at 23:59 (UTC).